When supply declines and demand increases, prices rise. Economists call this the law of supply and demand, not “the suggested relationship between supply and demand.” Yet the law doesn’t seem to be working in the labor market. Each month, the National Federation of Independent Business (NFIB) surveys its members. Its latest Small Business Economic Trends survey runs through April. Overall, small-business owners remain more optimistic than they’ve been at any time since 1983. However, they report problems hiring. 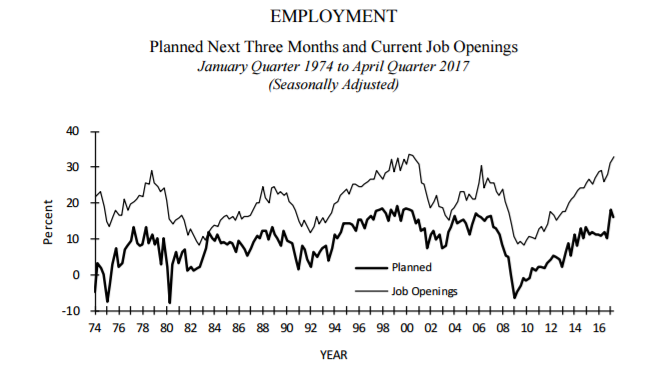 In the chart below, the thin line shows that 33% of small-business owners reported job openings they couldn’t fill. That’s the highest reading since November 2000. Even though it’s hard to find good employees, 16% of small-business owners plan to hire in the next three months. That’s the thick line on the chart. This is a high level of demand, consistent with strong economies in the past. In the chart, we see demand for employees is high but supply of qualified employees is low. The law of supply and demand tells us to expect the price of employees (compensation) to rise. But that’s not the case, at least for now. We know from government data that wages have increased just 2.5% in the past year. Something must change. To get qualified employees, businesses will need to pay more. Higher wages should contribute to higher inflation. This could finally push inflation above 2%. Higher inflation should allow businesses to increase prices. If the price increases are larger than the wage increases, and they usually are, profits should rise. This would be bullish for stocks. This is yet another piece of economic data pointing to a breakout in the stock market. While a pullback in stocks is possible, it would just provide a welcome buying opportunity.